In addition to four theme parks, the Walt Disney World Resort also offers two water parks: Typhoon Lagoon and Blizzard Beach. Both of these water parks boast unique themes and, in true Disney fashion, a great story! Blizzard Beach, however, just may have the craziest story in water park history. 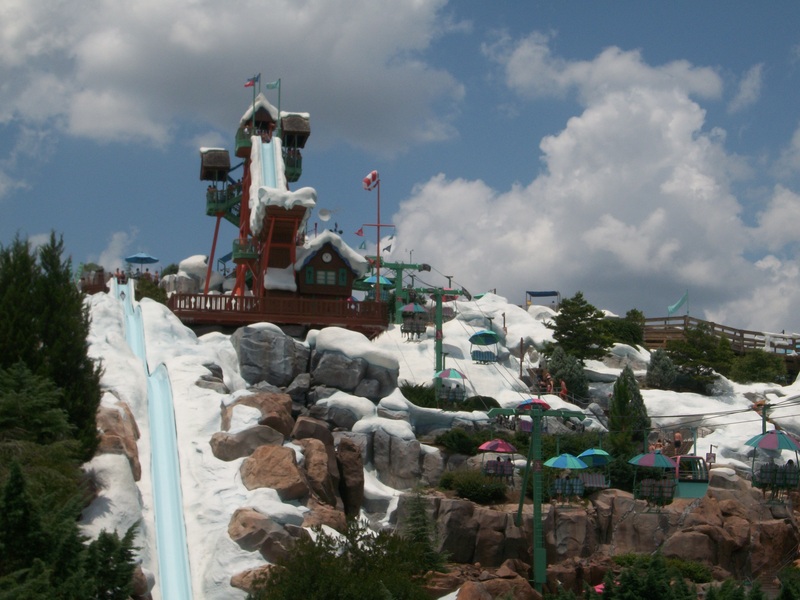 The legend states that a freak blizzard hit Central Florida and so a ski resort was quickly built; but when the Florida sunshine reappeared, the snow began to melt turning ski runs into water slides and snow drifts into refreshing pools. So instead of a ski resort, we now have Blizzard Beach, a whimsical, wintry water park where you swim among snow drifts and shop for beach towels in ski chalets! So if you’re considering a visit to this popular water park, check out these Disney Savvy Tips for Blizzard Beach to make your day as magical as possible. But wait! 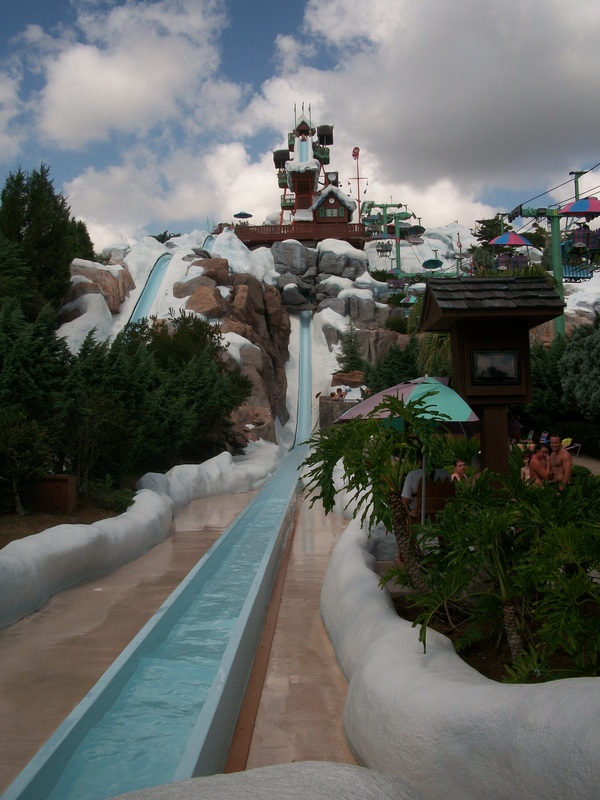 There are a few things you should know first before planning a trip to Blizzard Beach. First of all, Disney is now offering a 1-Day Water Park Pass which provides one-day admission to either Typhoon Lagoon or Blizzard Beach for $61.77 with tax for ages 10 and up or $53.25 for ages 3-9 with tax. This now means you can water park hop for a day! You can also purchase a Water Parks Annual Pass with unlimited admission to both water parks for $117.15 with tax for adults, or $105.44 with tax for kids ages 3-9. But if you have a Premium Annual Passport, you already have the privilege of unlimited admission to both parks. 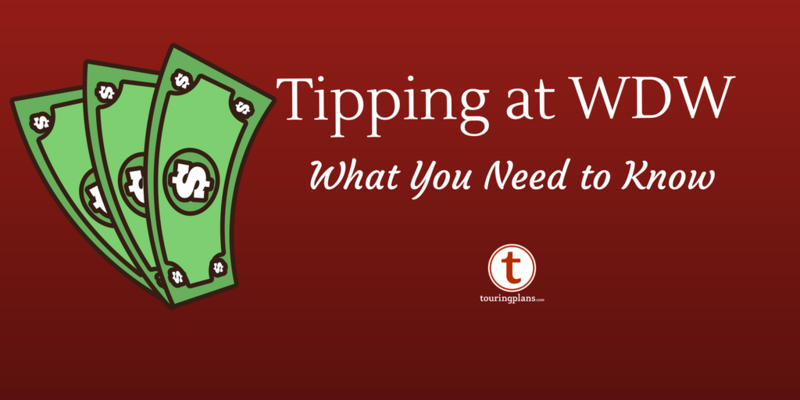 So are you ready for some Disney Savvy tips? 12. Be Prepared for Mount Gushmore – Mount Gushmore is the huge hill at the center of the park where you can find many of Blizzard Beach’s best slides. Just like a real ski resort, Mount Gushmore’s slides have been organized into different slopes, each with their own color. For example, both the Green Slope and Purple Slope and their slides can be found on Mount Gushmore. If you like to do it all when you visit a water park, you may find yourself running around Mount Gushmore a lot! But the question is, how do you get up there? Blizzard Beach offers a chair lift that transports guests up the mountain; but for those who like to keep their feet on the ground, there are also paths and stairs. But let me warn you! Heading up Mount Gushmore again and again wore me out during my last visit, so be prepared for a workout! 11. Don’t Forget the Sunscreen, Sunglasses, & Water Shoes – These three items are a definite must when visiting Blizzard Beach. First of all, it is so very easy to burn when you’re at a water park, so parents be sure to apply and reapply sunscreen on your kids throughout the day. Trust me, they will not enjoy the rest of your vacation or the travel home with a bad burn. I also encourage adults to do the same, even if you don’t usually burn. There’s very little shade when waiting in line for a slide on Mount Gushmore or when enjoying the waves in Melt-Away Bay, and you would be surprised how red you can get in a short period of time. Secondly, you will definitely need sunglasses at Blizzard Beach with the sun reflecting off the water and white snow drifts everywhere. If not, be prepared to squint the whole day. Lastly, the concrete paths around the park are cool in the shade, but can be blistering hot in the sun! When I last visited Blizzard Beach, I honestly don’t think I could’ve stood in line for a slide without water shoes as the pavement was unbearably hot. 8. Experience Cross Country Creek – Blizzard Beach’s lazy river, Cross Country Creek, is one of my favorite things at the park. It encircles the entire park and is both relaxing and entertaining! For instance, as you float along, you will encounter a leaky snow machine, the Ice Gator’s house that spews water from the chimney, and even a dark cave where icy water drips through. Cross Country Creek also has seven different landings where you can enter and exit; and the ice blue tubes you will find stacked here are for your use and are totally free! This particular attraction is fun for every member of the family and is also just a great way to get around the park. I love the Blizzard Beach snowman family! 9. Bring an Underwater Camera – Very few people come home from Disney World with photos from the water parks and that’s just a shame! 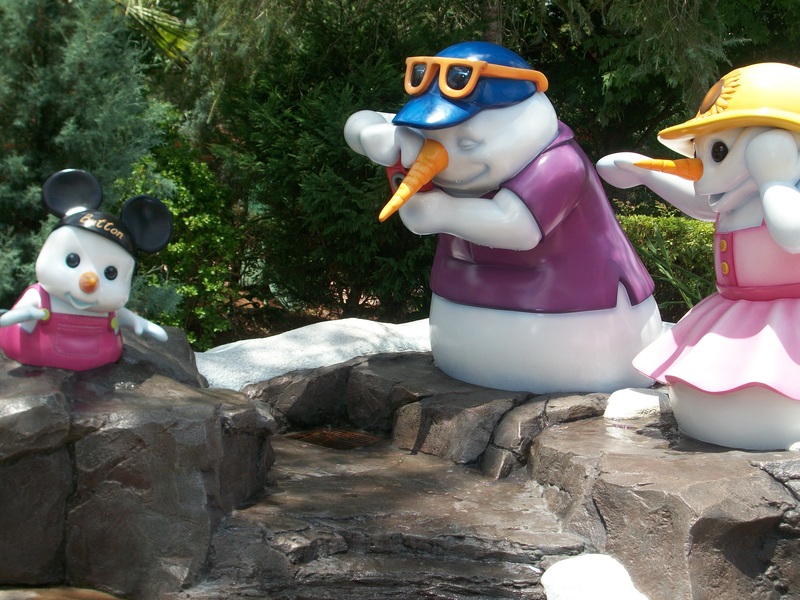 Blizzard Beach has lots of awesome photo-ops, such as my personal favorite, the snowman family! Also, it’s great having the ability to capture shots of your family enjoying the water park. Keep in mind that it’s usually cheaper to buy an underwater camera before your trip; but if you forget, you can usually find them for sale at the Beach Haus inside the park. 8. Take the Kids to Tike’s Peak & Ski Patrol Training Camp – Blizzard Beach has two great areas for kids: Tike’s Peak and the Ski Patrol Training Camp. Tike’s Peak is designed for children under 48 inches and features mini-slides and cute wading pools with the Blizzard Beach theme. I highly recommend it for parents with little ones in tow. The Ski Patrol Training Camp is geared toward school-age kids and is very popular! This area features slides, a zip line, and even an obstacle course where kids cross floating ice bergs. Personally, I think it’s great that Blizzard Beach has an area designed for this particular age group, especially if they’re not quite ready for some of the park’s more thrilling slides and attractions. Debating whether or not to take your young kids to a Disney World water park? Check out some helpful info and advice here. 7. Do Summit Plummet First – It’s pretty hard to miss Summit Plummet. It’s the park’s icon and looks like a ski jump, but it’s actually one of the tallest and fastest free-fall slides in the world! Now I have a confession to make, I have never been able to work up the nerve to conquer Summit Plummet myself; but what I do know is that it’s 12 stories high and that the slide is so steep that it’s hard to see where you’re going. Naturally, this slide draws thrill-seekers and the line is almost always long. So, if you’re brave enough to take on Summit Plummet yourself, I would suggest heading to this slide first thing when the park opens and be prepared to climb some stairs. 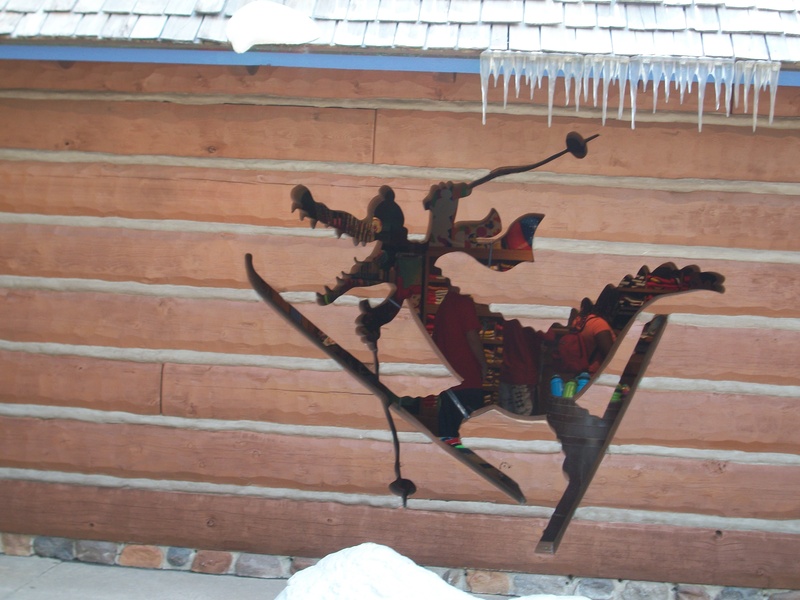 Also, be aware that riders must be at least 48 inches tall to plunge down Summit Plummet. 6. Don’t Waste Your Cash on Blizzard Beach Dining– While Blizzard Beach has great snacks, their actual meals are less than impressive in my opinion. While it has improved, we’re still talking hot dogs, burgers, and flatbreads at Blizzard Beach’s Lottawatta Lodge and other food stands. 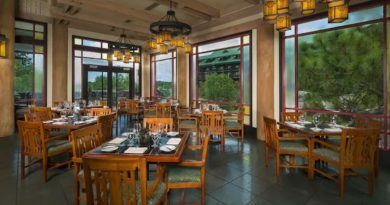 As a meal at Lottawatta Lodge costs about $15.oo on average, I would suggest snacking while at the water park or eating a big meal before you go to save your cash and dining credits for one of Disney World’s better eateries. 5. 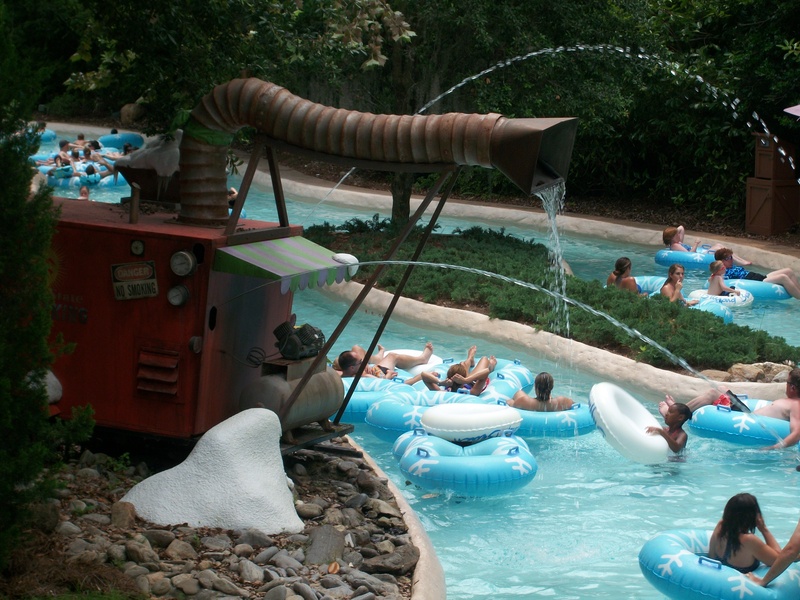 Look for the Ice Gator – The story behind Blizzard Beach includes a funny little character, the Ice Gator. The idea to turn the ski resort into a water park first occurred to resort owners when they saw a frosty blue gator sliding down the melting ski runs. You can still see a few nods to the Ice Gator around Blizzard Beach, particularly at the Beach Haus where it’s clear that he lost control down those slushy slopes! 4. Know What to Bring & What Not to Bring– I always recommend bringing your own towels to the water parks. You can rent them for $2, but that means you can’t take them with you resulting in a wet and chilly ride back to your resort. Life jackets are free at Blizzard Beach, but you can also bring your own if you wish; and lastly, locker rentals from Snowless Joes are $13 for a small size and $15 for a large with a $5 refundable deposit. Alcohol and glass containers are not allowed at Blizzard Beach, and neither are pool toys. This may be disappointing to your kids; but believe me, hundreds of pool noodles are anything but magical. Finally, be smart with what swimsuit you choose to bring. 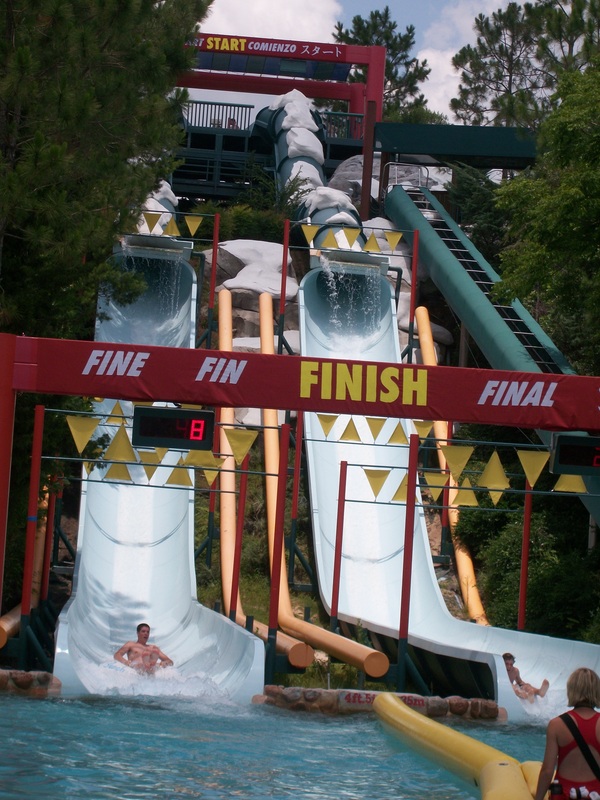 Suits with exposed metal are usually not permitted on slides; and if you’re planning on taking the plunge down Summit Plummet, you’re going to want to wear your swimsuit that has the most coverage! 3. Take the Chair Lift at Least Once – Just like a real ski resort, Blizzard Beach has a chair lift, complete with skis attached to the bottom of each chair! Seriously, Disney thinks of everything. But the chair lift isn’t just for decoration, it’s actually used to transport guests up Mount Gushmore. What I like most about the chair lift is that it offers some awesome aerial views of the park and is a big hit with kids. 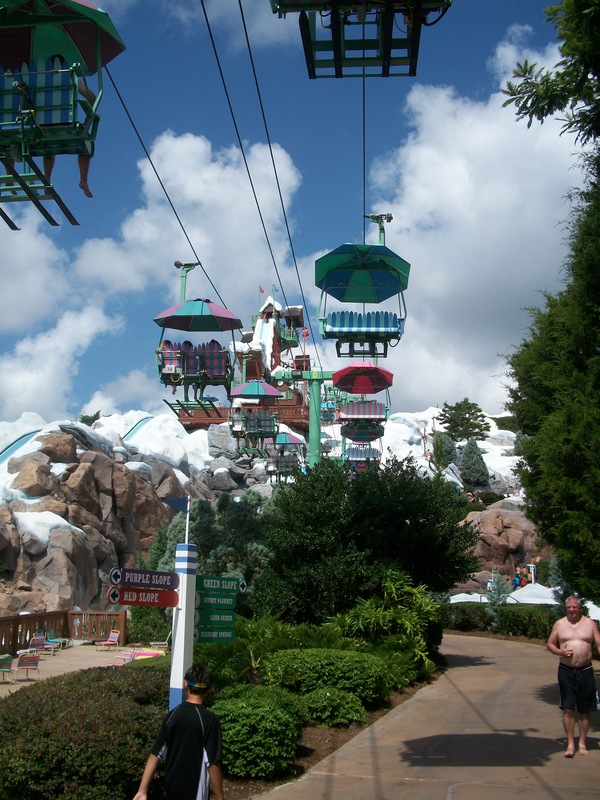 The line can be long for the chair lift, but it’s part of the Blizzard Beach experience. Need to save time? There is usually a singles line which typically moves fast! 2. Try the Mini-Donuts – The best snack to be had at Blizzard Beach has to be the Mini-Donuts with White Chocolate, Chocolate, and Raspberry dipping sauces! They are incredibly popular and the perfect remedy after a few hours of swimming and splashing. You can get a 1/2 dozen with 1 dipping sauce for $5.29 or 1 dozen with 2 dipping sauces for $9.99. 1. 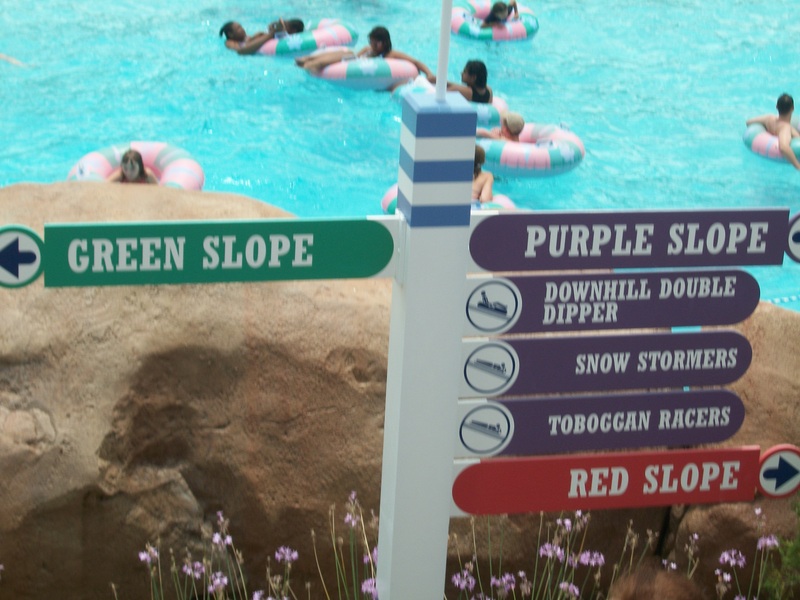 Bring Your Competitive Side – The slides found on the Purple Slope at Blizzard Beach allow you to compete with your family and other guests! Most of them are side by side and have clocks at the bottom revealing the different times. You may find yourself sliding again and again, just to improve your time or to beat that certain member in your family who’s always just ahead of you! My personal favorite slide to do a little racing is the Toboggan Racers, where you ride a foam mat down one of eight lanes to the bottom. The Downhill Double Dipper also gives you the chance to compete as you try to beat the rider in the tube next to you as you slip down a 50 foot hill! 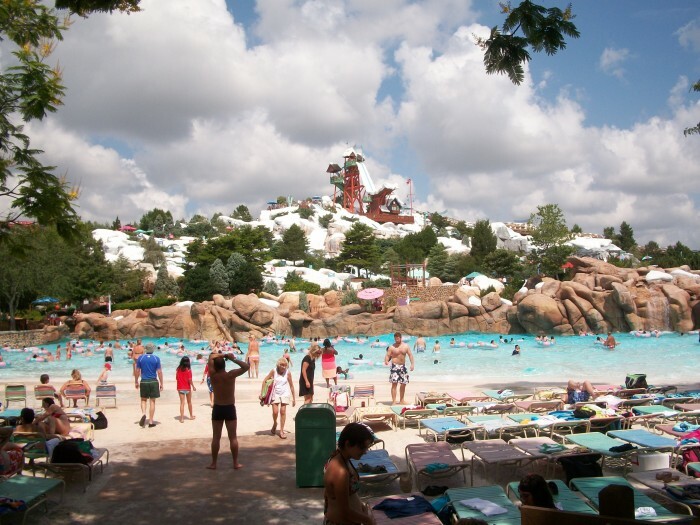 So these are a few tips to help you be Disney Savvy when it comes to Disney’s Blizzard Beach! Do you have any water park tips to share? Or are you considering planning a visit to Blizzard Beach? Let me know! Looking for tips for Disney World’s other water park? Check out Disney Savvy Tips for Typhoon Lagoon. Just a little story about our 2008 trip to Blizzard Beach. Blizzard Beach didn’t appear on our GPS. We knew about where it was as we had seen a few signs in the area, but weren’t exactly sure. So we left our off-property condo early just to make sure we got there by opening. We got there much earlier than expected and was the second family there almost an hour before the gates opened. The second family had a couple of teenagers, and my boys were aged 10 & 9 at the time, so the younger one propped his head up against the turnstiles and I prepared for a very long wait with two impatient boys. We didn’t wait long because about 15 minutes late a photograph, a security guard, and a lifeguard came down to the front. The lifeguard started chatting with my younger son about what we had seen so far, and if he was excited to go down Summit Plummet. He said he was, and the lifeguard replied that it was broken recently, but they just got it fixed and needed someone to test it, and wondered if he would be willing to do that! Of course he said yes, so we were let into the park early! They outfitted us with free towels, free locker rental, two free all-you-can-drink mugs, a “Ski-Captain” medal for my son, and gave us the best shelter right in the center of the park! It was an awesome experience to see my younger son beaming the rest of the trip about the attention he was getting. And I thoroughly enjoyed the third trip down Summit Plummet that day after my two boys took their turn. We had so much fun that day that we went back for a half day trip on our last day of our trip. There my wife and I shared one more special moment. She was 4 months pregnant at the time, and we were lounging on deck chairs watching the boys play in the kids area. She had her hands on her stomach and said to me that she could feel the baby kicking outside of her tummy for the first time! I put my hand on her stomach, and sure enough, I could feel it too! A tear rolled down my cheek because I knew that I would never forget that moment as long as I live. What a wonderful story! I love hearing how Cast Members go out of their way to make a family’s day, and what a precious memory for you and your wife. Thanks so much for sharing! What are the lines like in the summer? Longest waits? The best thing to do in the middle of the day when it is most crowded is the Red Slope slides in the back of the park. Hardly anybody knows they are there, so the lines are usually short at any time of the day. Another tip: If you’ve planned a day for BB and it starts to rain, there are two options for you. If it’s been less than 4 hours since you entered the park you can ask for a rain check that is good for one year. But….if you can wait out the rain and it lasts any more than an hour or two, you will probably have the place to yourself when things open back up!! I didn’t know about my first point when we went last year so we chose to wait out the storm. The pools and slides were closed for about 2 hours so my DD and I had lunch, hung out chatting together and then headed back in as soon as we could. The great part was that most people had left so for the rest of the day (3 hours) we rode slides over and over and over again! Often there was nobody in line when we would reach the top of the stairs so it was a quick trip down then the climb back up. My suggestion is if you’ve planned the day anyway and can wait out the storm, you won’t be disappointed! Definitely great advice! Don’t let the rain scare you! We visited in early December and planned to go to Blizzard Beach after lunch one day. It had started to rain on our way to the park and by the time it got there, it was empty! There was no thunder or lightning so everything stayed open and we did the entire park without waiting for anything. We were so exhausted from all of the stairs hah. I’m sure the fact that it was December with temperatures in the 70’s was enough to lower crowds anyway, but the rain cleared the place out. The rain was on and off, but you’re already wet from the rides so it was no big deal! BB is the only part of Disney we haven’t experienced. Not for any particular reason, just not enough time. However it just hit me while looking at the photos in this blog that this is the only place to still experience what has been missing for many years at Magic Kingdom: Sky Buckets! OK, so they’re chair lifts but still, I hadn’t considered the similarity. My wife and I miss that experience from trips many years ago and might make time next trip to ride them again. The ice gator cutout into the Beach Haus is the end of the ride from Summit Plummet. If you stand at the gator-shaped hole and look back into the park, you’ll see ski tracks on the adjacent roof that line up with Summit Plummet. Amazing level of detail that a Cast Member pointed out to me a few years ago.